The Lodge is the main building on site and is where our community comes together to eat, study, and practice. 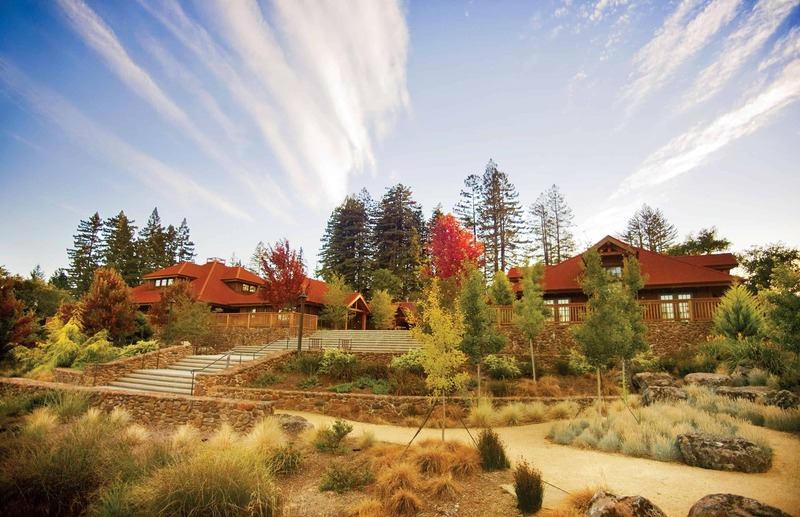 The kitchen, meditation hall, classroom, and conference center are part of the lodge area and are available for use when not needed for visiting retreat programs. The library, also located at the lodge, has a wide range of books for study and self-enrichment available to volunteers. Most Ratna Ling volunteers live in a ring of cabins located across the street from the lodge. 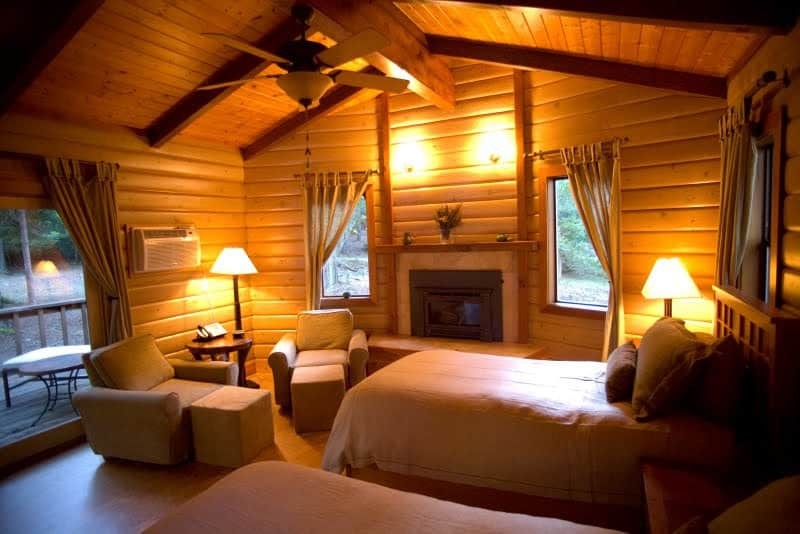 The cabins are quite comfortable and have two twin beds. Cabins also include a private bathroom with a bathtub and shower combination (excluding one), a large closet, nightstands with two-drawer dressers, microwave, mini-fridge, gas fireplace, and deck. Usually, cabins house two people. During very large retreats, some volunteers may be asked to bunk up for short periods of time, usually no longer than 2 weeks, to make room for retreat guests. Washers and dryers are available in the Commons building, located at the center of the volunteer cabin circle. Long-term volunteers or volunteers with special circumstances may live in one of two larger houses, which have 5 or more private rooms and shared kitchen, living space, bathrooms and laundry. 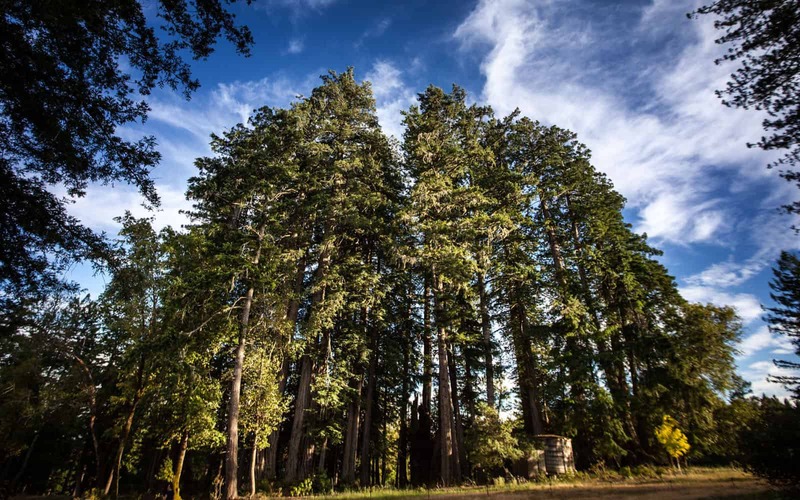 Ratna Ling is located on a remote, redwood forested ridge of coastal Sonoma County about 4 miles from the ocean. Basic supplies are available from the Fort Ross store about 20 minutes away, which doubles as the Coast Bus stop where volunteers coming by bus will start the last leg of their journey to Ratna Ling. The town of Gualala, located around 45 mins. north on Route 1, is the closest stop for basic medical care and supplies not available at the Fort Ross store. Trips are infrequent so its not uncommon for volunteers to coordinate having supplies picked up when someone goes into town. Located only a mile or two from Ratna Ling, Salt Point State Park has 3 trailheads within walking distance and contains a network of trails that travel all the way down to the coast. One route popular among volunteers is the walk from Ratna Ling via Kruse Ranch Road to Stump Beach trail which spills out to a beautiful cove on the ocean. About 8 miles round trip, the walk takes 1.5 hours down and 2 hours back up the ridge and offers an opportunity to connect with the natural peace and beauty of nature alone or in the company of other volunteers.